Next Saturday, March 8, I will be speaking at Historic Macon Foundation's inaugural Design, Wine, & Dine event. The two-day event will feature talks and demonstrations related to design, wine, and food. Other speakers include Susan Sully and Sara Foster. My talk is slated for 1pm with a book-signing event to follow. It should be a really interesting event, so I hope you'll consider visiting Macon that weekend to attend. For more information, please visit Historic Macon Foundation's website. 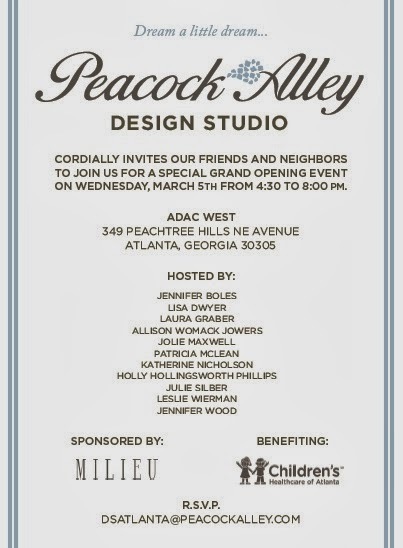 I hope that you'll join me next Wednesday evening to celebrate the grand opening of Peacock Alley's new Atlanta design studio. Atlantans are already buzzing about Peacock Alley's beautiful new showroom. See below for details and RSVP information. And finally, if you plan to be in Charleston, SC on March 12-16, you might be interested in attending the 17th annual Charleston Arts & Antiques Forum. Although I am not participating in the event, I thought it might be of interest to many of you. This year's theme is By George! and will focus on the houses, furnishings, and gardens from the Georgian period. For more information, please visit their website. Design Bloggers Conference?! That sounds interesting; I wish I had known, I thought at first. But I am not familiar with the keynote speakers, so maybe it's not for me after all. If you go, I hope you'll report on any interesting points.